Less pillow, more comfort blanket, this gentle, stringsified reggae lope starts with a promise of heartbreak – that bowed and broken intro – which the lyrics might keep but the music doesn’t. It’s not that reggae songs can’t be sad, but ones as jauntily and lightly played as this would find it difficult: the rhythm here is lending Nash strength, not underpinning his sorrow. 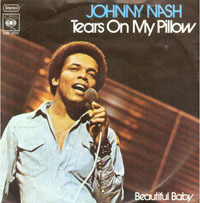 It may not carry much emotional punch, but “Tears On My Pillow” is perfectly acceptable pop – a strong melody, well-sung. The only duff moment is the spoken word mumble in the middle – one of the least committed I’ve ever heard. My copy of the Front Line LP bore the Caroline label, which likely accounts for the C in VC. Eddie and the Hot Rods played “Get Out Of Denver” on TOTP – that was a good “awkward-viewing-with-your-dad” moment for me. The Marquee EP was recorded in July 1976 – we’ll no doubt return to the subject in Popular before long, but can you imagine how hot it must have been in there?! Eddie & The Hotrods performed ‘Get Out Of Denver’ on the TOTP transmitted on the 9th of September 1976. Also in the studio that week were Twiggy, The Wurzels, Cliff Richard, The Bay City Rollers, Kiki Dee and Manfred Mann’s Earth Band, as well as Ruby Flipper – interpreting ‘You’ll Never Find Another Love Like Mine’. Jimmy Saville hosted. The BBC actually kept this one! I had totally forgotten about Ruby Flipper, the missing link between Pan’s People and, um, Zoo? I don’t think I’m going to upset the Spoiler Bunny too much by saying…Twiggy?!? She did attempt a brief singing career in ’76 and had a Top 20 hit with “Here I Go Again” (unrelated to any other songs entitled “Here I Go Again”), a winsome C&W waltz, as well as an eponymously-titled Top 40 album. Yes, I’d have liked to hear her doing Whitesnake’s song of the same title. September ’76 is slightly out of the chronology, but Manfred Mann’s Earth Band at Manchester Free Trade Hall was my first ever gig! Oh Gawd, “Here I Go Again”… as played TO DEATH on Radio One, during the Long Hot Phew Whorra Scorcher Summer of 76. Was nothing to do with me! Thanks to Alan, who does all our technical stuff. Re#64-Marcello, Ruby Flipper(great name!) were the missing link between Pan’s People and Leg’s & Co. Zoo turned up in the early 80s for a brief spell before the popularity of video killed them off. My excuse is that all the post-Pan’s People troupes were so bad that it’s easy to get them mixed up chronologically but in truth that’s a very poor excuse. Zoo, then, would have been responsible for the execrable routine to “Back On The Chain Gang” by the Pretenders (think: overly literal interpretation) in 1982. Although the worst TOTP dance routine ever was also in 1982 where all the Radio 1 DJs “danced” to “Friend Or Foe” by Adam Ant and there was a freeze-frame for every single one, even Adrian Juste. Also see whole of 1983 where go-go dancers routinely managed to block out any view of the act themselves (most notoriously “The First Picture Of You” by the Lotus Eaters). Ah! “The First Picture Of You”. What a lovely track that was. I haven’t heard the expression “go-go dancers” since “your old mate” Brian Matthew was a boy! That would, of course, be Brian Mathew wit one t. And don’t knock him – Saturday Club may not have been much but once it was about all there was! I’ve always had time for Brian. His late 70s/early 80s “Round Midnight” shows were really rather delightful at times, and I particularly remember a lovely interview with Ian Dury. His current Saturday morning “Sound of the Sixties” show is also frequently fascinating, in terms of the obscurities it digs up. Yes, “Sound of the Sixties” is indeed a brilliantly presented (and researched) show. It certainly does not churn out the same old stuff week after week. As Mike Atkinson says, many obscurities are dug up and these are generally of great interest, as well as enlightening. The linchpin is of course dear old Brian, who’s been around since the Arc and thus knows exactly what he’s talking about and whom I would never dream of having a pop at. This would rather be like knocking Colin Berry or James Alexander Gordon, both of whom probably predate Marconi. And Brian Mathew has a claim to being another “Fifth Beatle” – the Fabs’ appearances on “Saturday Club” and their rapport with Mathew must have been a great boost to their fanbase as well as establishing their personalities in the nation’s affections. Not sure how we got here from Johnny Nash but never mind! Fervently agree about Sounds Of The ’60s, my preferred breakfast/shower/dressing soundtrack of a Saturday morn – this week’s edition was spectacularly good. I admire the skill with which Mathew manages to mix familiar favourites with WTF obscurities and obviously the authority he has from actually having been there and lived through it all. #66 and “Here I go again” Twiggy. Was shocked and stunned a few years ago to hear the original version by Country Joe and the Fish! Suddenly realising it’s actually a good song. Thought I’d revive this thread by suggesting Johnny Nash is a forgotten, major player in the popularisation of Jamaican music. His first hit Hold Me Tight (no.5 in the UK and the US) was in the summer of ’68 which (needing some guidance from Tim or Sukrat here?) I thinkpre-dates use of the term Reggae. It was Rocksteady, I believe – the first and only instances of that genre breaching Top 10s in Britain or America. As for the much-lambasted Willesden Strings, wouldn’t they have taken their lead from Nash? After all, he had two more UK Top 10 hits before the 60s were out, let alone his 70s run. Which leads me to suggest that a Houston-born African American – and the first non-Jamaican to use a Jamaican recording studio – was responsible for the ‘sweetening’ of Reggae. The word “reggae” was around by 1968 but was only just starting to be used in a musical context, I think – “Do The Reggay” came out in ’68 IIRC but I don’t remember exactly when. Interesting the growth of reggae and the appearance of the first groups of skinheads on the terraces (at various London clubs but first and primarily at West Ham and Chelsea)more or less exactly mirror each other. ie the first few reggae tracks selling to those in the know (Johnny Nash aside)in the 2nd half of 1968 coinciding with the Chelsea and West Ham skins at the start of season 1968-69 and storming the charts in 1969 as the skinhead style spread to every English football club by the end of that season. The second number one of my life, and I don’t think I’d heard it before today. A big disappointment: where’s the tune?